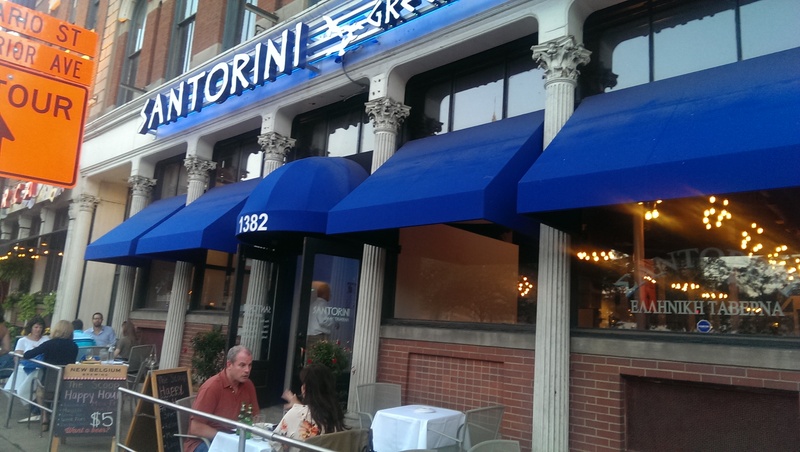 I have been missing a good, authentic Greek restaurant in Cleveland. I learned to love Greek food at the Greek restaurant around the corner from my house in Germany. I spent many a lovely evening in their grapevine-covered backyard, enjoying saganaki, gyros and souflaki. There is nothing better than grilled meats. Located on W. 9th next to Mallorca, Santorini doesn’t have a grapevine-covered backyard, but it does have some awesome food to make up for it. I met some girlfriends there for dinner the other night. I had made a reservation for 5 people, and the restaurant had our table set and waiting for us. There was some question whether a couple others would be joining us, but the waiter assured us it would not be a problem. They were very busy that night with a dating group/happy hour event of some sort and another large table twice our size, so I appreciated the willingness to be accommodating if needed. We started off ordering a bunch of appetizers to share among the table. There were two vegetarians in the group, so our choices tended to be vegetarian-friendly or pescatarian-friendly. With Greek food that was not a problem at all! 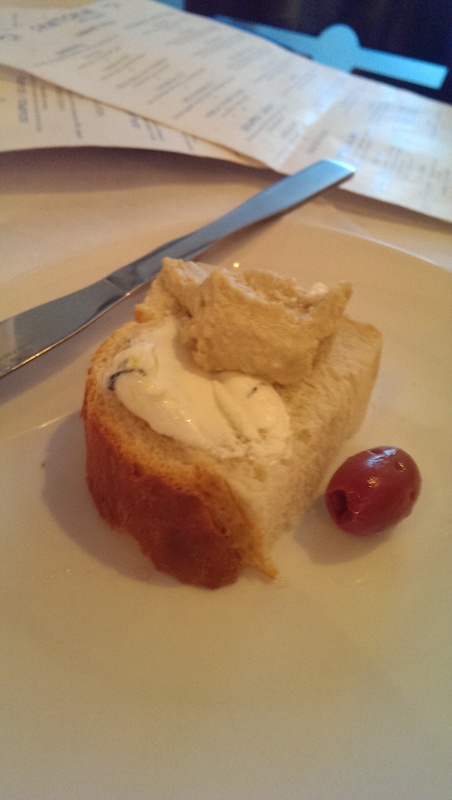 The waiter took our drink orders and had a basket of bread with yogurt butter in olive oil, hummus and labneh, and olives sent to the table. 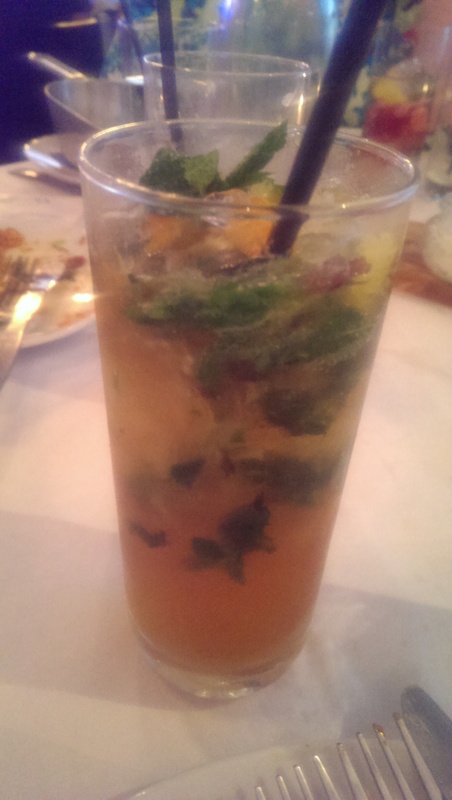 I had the blueberry mojito, and it was tasty and refreshing. It featured fresh blueberries and was not overly sweet. The photo here is of a Santorini special cocktail featuring a Greek liquor and with mint and orange flavors. I received this free when the bartenders messed up one of my friend’s drink orders and we got two of the same thing. I sacrificed for the table. It was delicious. 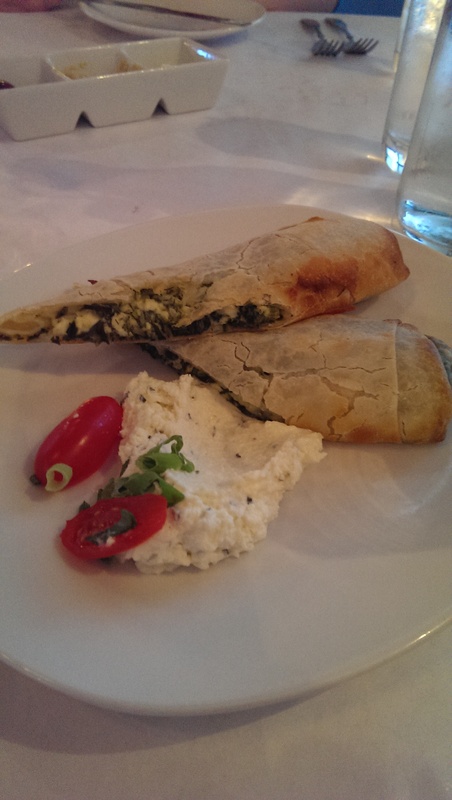 The hit of the table were the spanakopita that I ordered and the saganaki one of my friends ordered. The spanakopita was without a doubt the best spanakopita I have ever eaten, and several of my friends shared that opinion. The crust was light, the filling was a fluffy mix of feta and spinach, and it had a bright flavor that I believe was lemon. A mix of feta cheese and Greek yogurt was served on the side. It was spectacular. I don’t know if it is worth $13, but I would still order it again. 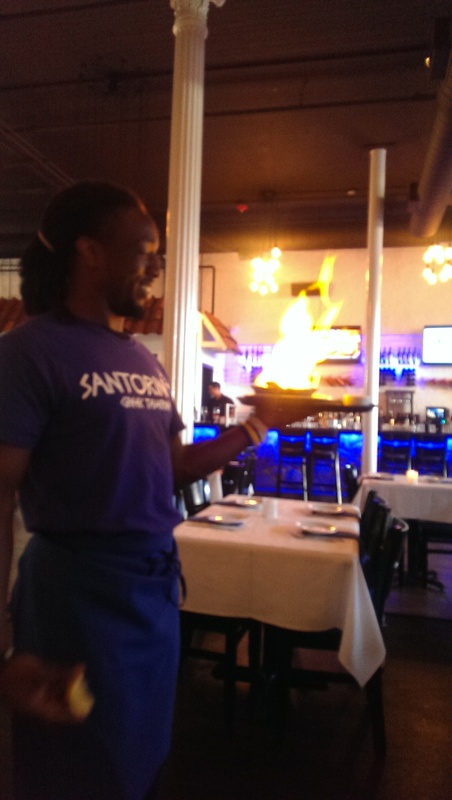 The waiter brought out the saganaki and lit it on fire with dramatics befitting the dish. After a minute or so he then extinguished the flames with lemon juice. It was served with pita bread. 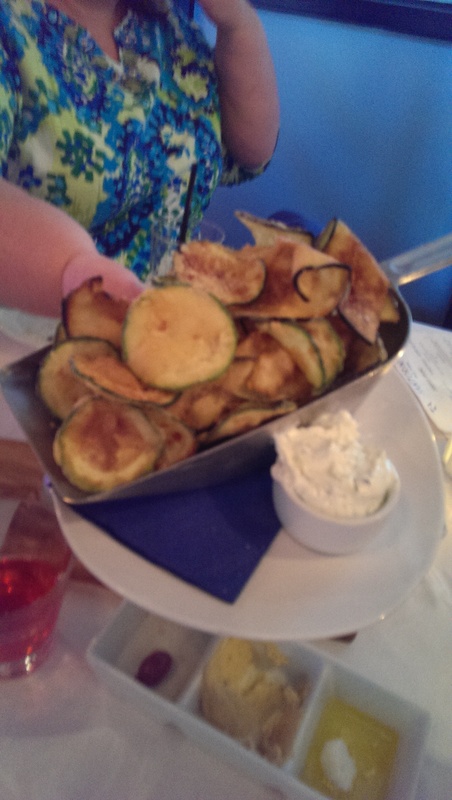 I was surprised to enjoy the fried eggplant and zucchini chips (Kolokythakia) as much as I did. Shaved thin and lightly coated with what might be breadcrumbs and cheese, these chips were addictive, and I could not stop eating them. 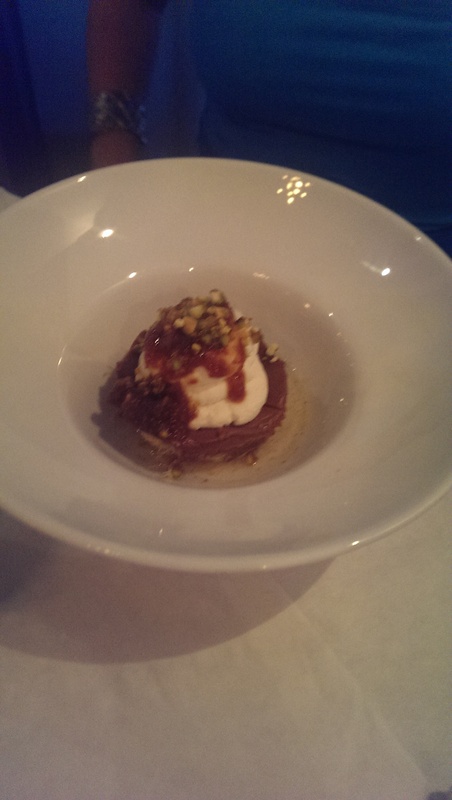 The presentation was also whimsical, as they were served in a big metal ice scoop with a side of tzatziki. I was less impressed with the feta dip one of friends ordered. 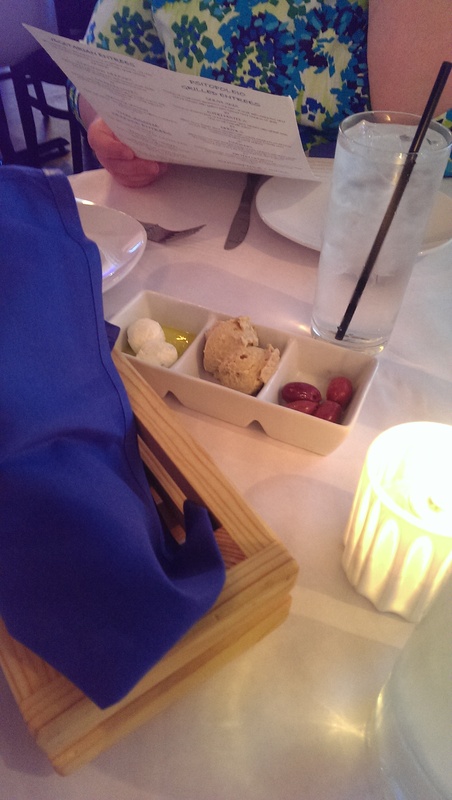 The presentation was cute (in a little jar on the wooden slab – see photo below), but it didn’t hold up against the other dips on the table, such as the tzatziki with the chips. I was expecting it to be creamier than it was, but it was kind of dry. She ended up taking most of it home with her. Another friend (who is Greek) ordered a couple of sides. She chose the Horta (blanched greens drizzled with olive oil and lemon juice) and I believe the Spanakorizo, which was Greek rice with spinach and chopped tomato. Both were quite good. I unfortunately failed to photograph them. 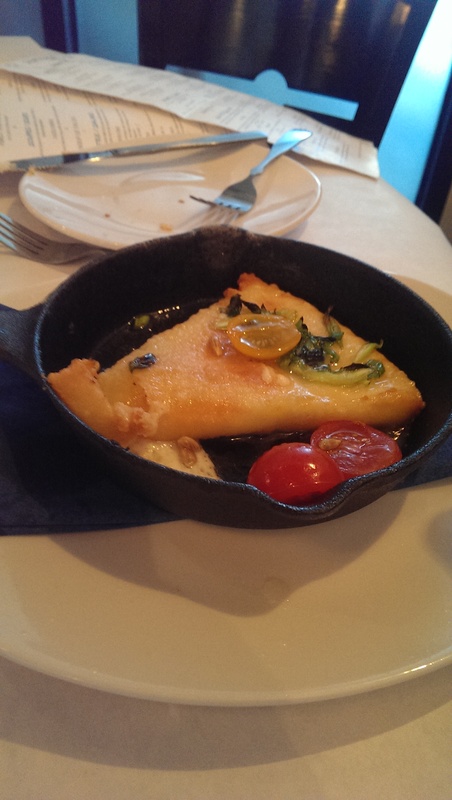 Another friend had a mix-up with her order, and she ended up with both the Chtenia (pan-seared diver scallops in a butter sauce over spinach, feta cheese, and bacon) and the Garides Saganaki (shrimp sauteed with olive oil, tomatoes, scallions, garlic and feta). Both were exceptional, but I preferred the scallops over the shrimp. Again, I failed to photograph them in all the confusion and the clearing of the plates to make room for more. The original plan had been to order some appetizers and then entrees, but with all of the appetizers we ordered I was starting to feel full. I decided to order the grilled octopus (or Octapodi as I was corrected several times) instead of the seafood orzo I had been anticipating. 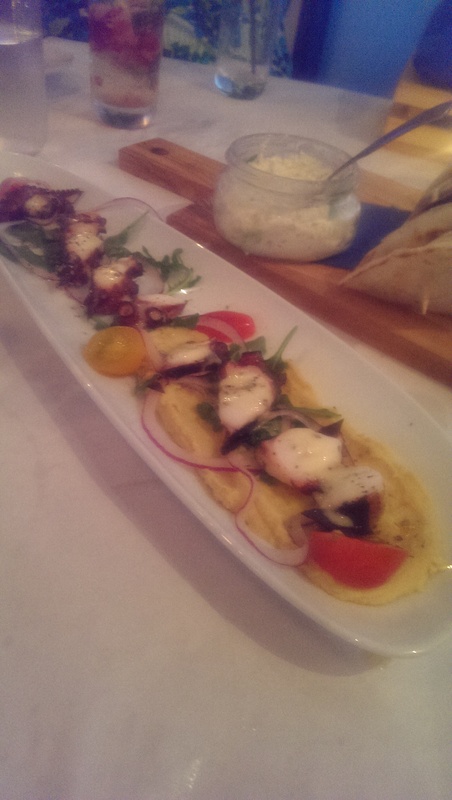 The octopus tentacles were firm and meaty and had a nice char from the grill. They were served on a bed of split yellow peas, shaved red onion, and some cherry tomatoes. The puree itself was delicious. It was a little pricier than I expected given the portion size, but it isn’t like octopus is a local delicacy. 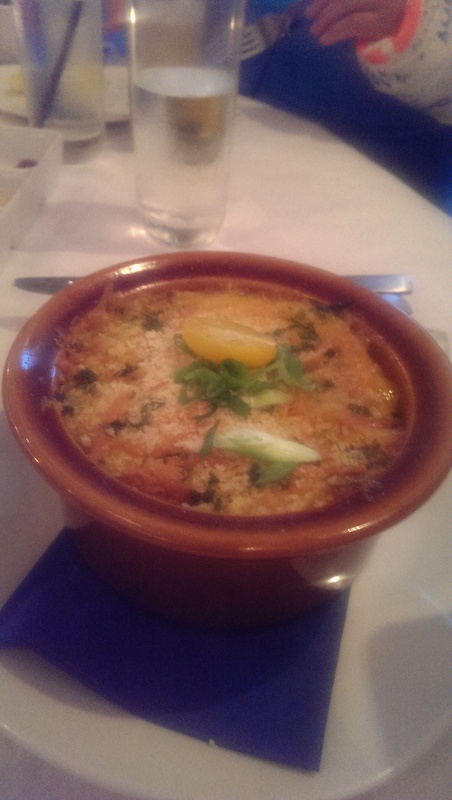 One friend was brave enough to order an entree, the moussaka, which was recommended by the waiter. She enjoyed it and offered a taste. It was good, but I was so full I couldn’t appreciate it. Unfortunately there were a few hiccups that night. The air conditioning was not working, and it was easily over 100 degrees in the restaurant. It made us feel like we were definitely in the tropics of Greece. Also, the happy hour event monopolized the bartenders to such an extent that we waited forever for our drinks (see above). There were also some miscommunications. 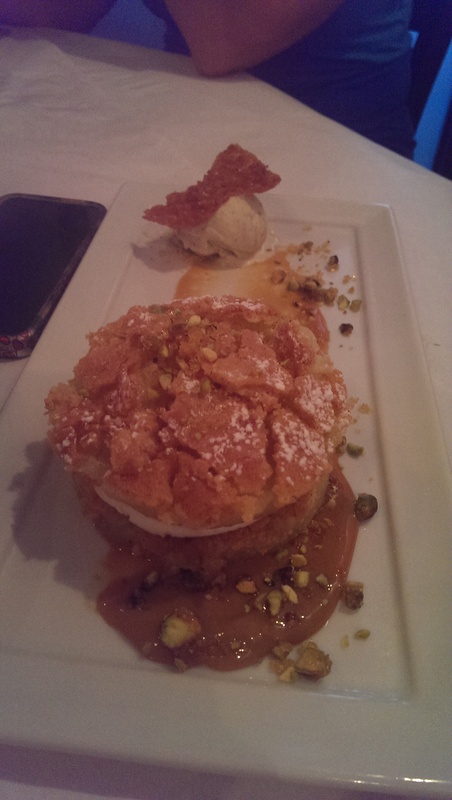 In fact, there were so many mishaps that the owner offered us dessert on the house. Two of my friends took advantage of the offer. I declined because I was stuffed, but I was able to enjoy a bite or two of their pastry with a delicious almond ice cream and some kind of chocolate mousse with pistachios. They apparently just hired a pastry chef a few months ago. I will definitely be back to give it another shot, because I have every intention of trying the calamari, seafood orzo, and of course the souflaki. And you can be sure I will be ordering the spanakopita!